When he was in elementary school, Yu-Chen spent a lot of time in his school’s library, reading about the adventures of heroes and heroines from around the globe. Inspired by the collection of literary works he read, Yu-Chen was drawn to writing as an art form, creating stories in his spare time for years. But, it wasn’t until the twelfth grade that he really did something with his writing, thanks in part to his Writing 12 class. About a month into the class, Yu-Chen heard about the Writing for Peace competition. While away on a humanitarian school trip to Senegal, Yu-Chen was amazed by the citizens of Senegal, who were kind, generous, and hardworking. Inspired by their endless strength and immersed in their rich culture, Yu-Chen decided to write the moment in his trip that had been the most memorable to him, as well as one of the most culturally educational. Hoping to share his experiences and the alluring complexity of Senegal’s culture with the world, Yu-Chen submitted his personal essay to the Writing for Peace competition. 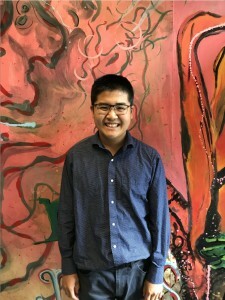 Currently a twelfth grader at Dr. Charles Best Secondary School in Coquitlam, Canada, Yu-Chen is quite passionate about writing and teaching. In fact, next year he will be headed to Simon Fraser University where he hopes to become an elementary school teacher. He also enjoys learning about different cultures in other countries, looking past the surface and discovering how the people of that country make their culture their own. As he continues to travel the globe, from Senegal to Cambodia to Thailand, Yu-Chen hopes to use his writing as a tool to share the cultures and the people that create them with the world. Yu-Chen Lim’s winning essay will be featured in our 2018 edition of DoveTales, An International Journal of the Arts.